Dubai Marina is getting ready to welcome the five-star Stella Di Mare Hotel, the first international location for the brand, which operates six successful resorts in Egypt. The 369-key hotel will comprise 252 king rooms, 72 twin rooms and 45 suites. All rooms will be fully air-conditioned, with high-speed wi-fi, flat-screen TV, personal safe, mini-bar and 24-hour room service. The property will feature three restaurants offering a range of dining experiences: Leonardo is a beautifully designed Italian restaurant, with the interior inspired by the genius of Leonardo da Vinci; Triton is a fusion and Mediterranean food restaurant; while La Fontana is an all-day dining venue offering an international buffet. There will also be three bars in the hotel, including: lobby lounge Orphic Bar providing snacks and Italian coffee; the pool bar providing daily refreshments; and the signature rooftop bar Skyland, located on the 31st floor of the property with spectacular views of Dubai Marina and serving a range of delicious house beverages, cocktails and mocktails. The 550 sq m spa will offer a variety of treatments, including massages, facials and beauty therapies. There will be separate male and female saunas, steam room, indoor jacuzzi and a stunning outdoor temperature-controlled swimming pool. The health and wellness options will also include an indoor gymnasium with a range of high quality equipment, plus a salon offering hair, nail and other beauty treatments. 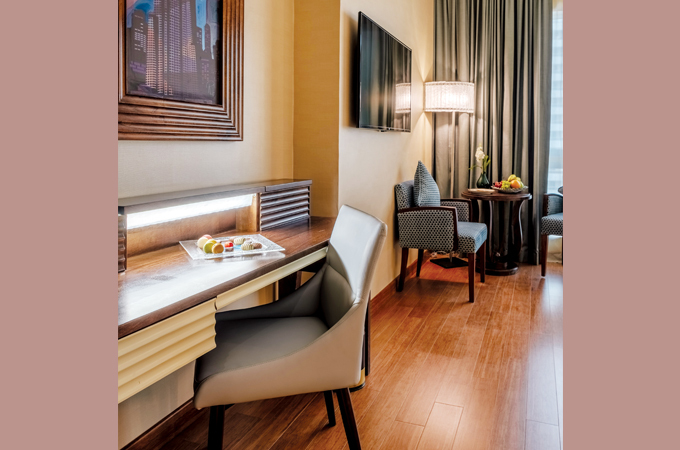 The hotel is conveniently located to reach the business areas of Jebel Ali Free Zone, Dubai Media City and Dubai Internet City, and a short walk to the metropolitan hub of JLT. Those looking to conduct business will be able to choose from a selection of meeting venues within the property, while there will also be a 500 sq m banquet hall to accommodate up to 500 people. Stella Di Mare offers easy access to popular areas within Dubai, including Jumeirah Beach Residence which is a 10-minute walk and Dubai Marina Mall a five-minute stroll away. Dubai International Airport and Dubai World Central Airport are both within 35 minutes’ drive.